Having problems running Frozen Bubble? Can I meet the game designers or other players on IRC? 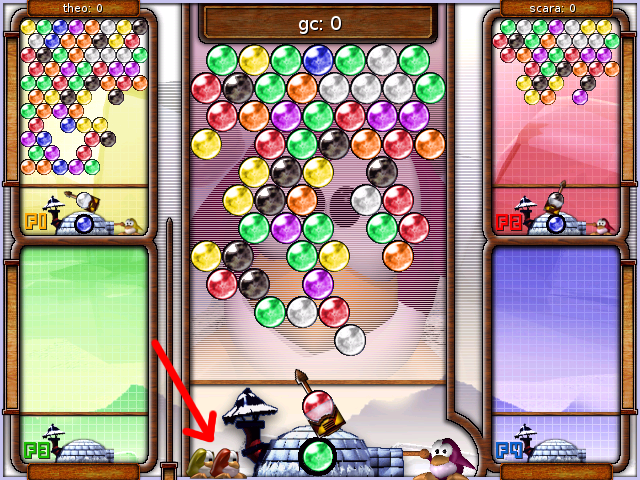 Notice: you can see who you attack because the F1..F4 little text next to the player turns white - you can see who is attacking by the presence of the small pinguins of the opponent on the left of your igloo. If you are colourblind, we already have what you're looking for: please use the -cbcommandline parameter, and bubbles will be printed with little geometrical symbols inside. First, please notice that we have developed this software on the GNU/Linux platform. There are ports to other operating systems, but we can't and don't want to support them. If you happen to be using Frozen-Bubble on FreeBSD, NetBSD, Windows or Mac OS X, please contact the authors of this "port" if you have trouble installing/running/whatever. Thank you. It seems this is related with buggy or badly installed nvidia drivers. Debian has a bugreport and a fix (http://bugs.debian.org/cgi-bin/bugreport.cgi?bug=223096) for this one. Either you didn't install sdlperl, or you installed it at the wrong location. Check where the file SDL.pm was installed on your system and what is the @INC search path of perl, there are chances they don't match. You're probably using buggy SDL-1.2.6 on an Intel processor; please update to SDL-1.2.7 or more recent. If you're using Windows, or Mac OS X, read the Ports section of the downloads page (http://www.frozen-bubble.org/downloads/#Ports)! man, you can do it, I am sure you can, don't quit trying so fast! Easy, go to the troubleshooting page (http://www.frozen-bubble.org/troubleshooting/). And don't forget we don't know your system or distribution, help yourself or ask your vendor. In the 3p/4p/5p network game, you can see F1, F2, F3 and F4 printed in the game screen - one function key per remote player. These keys allow you to aim at a particular remote player instead of everyone at the same time. 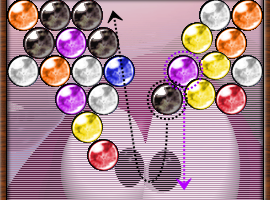 Indeed, by default, when you create malus bubbles to be sent to your opponents (by exploding a larger group or when bubbles were sticked to exploding bubbles), they are distributed evenly among all of the (living) opponents. 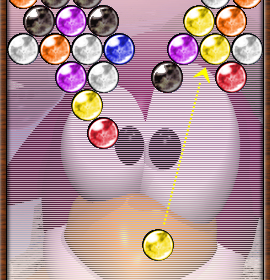 If you hit the, say, F2 key before (you can verify you did because F2 is then printed in white on the game screen), next time you will create malus bubbles, they will all be sent to the top-right opponent. This feature can allow you to team up or to aim at the strongest opponent. You can hit F10 to request back an evenly distribution. 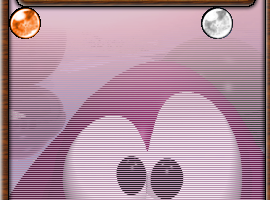 Notice that when using at least version 2.1.0, you can see who's attacking you at any time by looking at at pinguins left to your igloo (http://www.frozen-bubble.org/data/fb2.1-attackmaterialized.png). Easy, read the "Special keys" FAQ item. 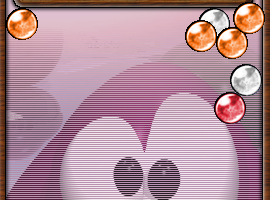 Because in 3p/4p/5p game, there is room for only one player with full size graphics. 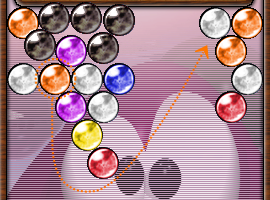 For the other players, the graphics are smaller (http://www.frozen-bubble.org/downloads/data/fb2-5p.png), so more than one local player is not possible. Sure! Please join the IRC channel #fb2-en for English, or #fb2-fr for French, on irc.freenode.net (http://freenode.net/) - though we're rarely there. Best is to send a mail. Talk to FROGGS or kthakore on #sdl irc.perl.org.